El Sueco de Arizon was the smallest ship traveling with the ill fated 1733 Spanish Treasure Fleet. In typical Spanish fashion her given name was lengthy. She was the Nuestra Senora del Rosario Santo Domingo, San Antonio y San Vincente Ferrer. However since she was built in Sweden, the nickname she was most often referred to was Sueco. In Spanish, this means "Swedish like, or acting like a Swede". When the hurricane struck, she was at the rear of the Flota with the Almiranta and the Angustias. Unable to outrun the strong Florida hurricane, she and the others in the fleet were forced westward over the sharp and jagged coral reefs. 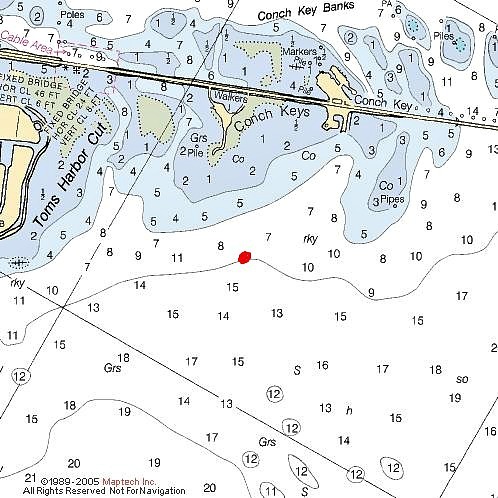 When she grounded, she was in less than 9 feet of water off Conch Key. Like the other vessels in the 1733 Spanish Treasure Fleet, she was brutalized by the Florida hurricane. Her sails were tattered, her mast broken, and her rudder ripped from her stern. Considering the force of the hurricane, the water washing over the decks, the listing and tilting of the small ship, it's incredible that all of her crew survived. Another amazing fact is that her crew were able to save most of her cargo which consisted of furs, Chinese porcelain, silver pesos, indigo, cochineal and tobacco. Where she came to rest is an area that's also plagued by strong currents. To have escaped the storm, only to fight the current, would have been an additional hardship the already weary and terrified crew wouldn't have expected. Over the centuries, the strong current and numerous tropical storms and hurricanes have broken this small ship up, moving her remnants over a greater swath. If you're scuba diving Florida Keys and plan on wreck diving site, you need to know that the visibility can be quite poor, and the current very strong. When you get to this Marathon diving site you'll also discover her egg shaped ballast. It's spread over two adjacent areas, piled around the turtle grass and it also leads to shore. When Florida Keys scuba diving, El Sueco de Arizon is not the most popular dive site to go to. This is due to the limited visibility and strong current where she lies. However this dive site does have the element of history that attracts those willing to deal with these wreck diving challenges. If you're in Marathon diving, and the weather's rough, or you don't want to go far out, this shallow, close to shore site gives you a nice alternative. Plus there's always the lurking possibility that some silver Spanish coins may still be buried in the sand. It's certainly worth the dive, if you've got the time.